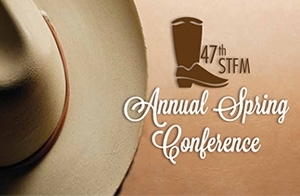 The 47th Spring Conference of the Society for Teachers of Family Medicine (STFM) was held May 3-7, 2014, in San Antonio, TX. Eighteen UW Department of Family Medicine (DFM) faculty, residents and staff made presentations on innovations in family medicine education at the 47th Spring Conference of the Society for Teachers of Family Medicine (STFM), held May 3-7, 2014, in San Antonio, TX. Through roundtables, seminars, workshops and poster presentations, they covered such important topics as incorporating population health into family medicine education, using mobile technology in precepting, enhancing resident education in obstetrics, and improving practice-based learning. In addition, Allen Last, MD, MPH, director of the DFM’s Fox Valley residency program, served on the conference’s education committee. Building on the mentoring theme woven throughout the conference, DFM Emeritus Professor and former Chair John Frey, MD, gave a motivational presentation, “Learning From Each Other: We Are All Pilgrims on the Road,” at a mentoring luncheon. In his talk, Dr. Frey shared examples of how mentors—formal or informal—provide guidance and support throughout one’s career, and the lessons to be learned from those experiences. Comprising nearly 5,000 family medicine faculty, preceptors, and residency program directors, STFM is a community of educators that aims to improve health through the advancement of family medicine. Download the complete 2014 program, abstracts and handouts from the STFM Web site. The National Clerkship Curriculum: What Do All STFM Faculty Need to Know?